Abi King, ‘21, who scored the winning goal, cradling and running hard with the ball. The Girls JV Lacrosse game on Saturday, April 13 against Litchfield Hills, was by far one of the more competitive and thrilling games played at Canterbury this year. And that is saying a lot when taking into consideration all the games that happen throughout a Canterbury school year. It was one of those come-from-behind-moment games that has everyone cheering and wanting more. New head coach, Mrs. Lord, had no idea what to expect when she took over the coaching reins. She said she heard they were a “strong team” and that is proving to be the case. The game remained competitive and close throughout, as both teams traded possession only a few times throughout the first half and barely gave up goals. The game entered the half tied at two. However, things got dicey when in the middle of the second half, Litchfield scored a third goal, putting them up on the Saints by one. This didn’t stop the Saints however. They continued to battle the rest of the half, earning possession after possession, making stop after stop, save after save, just to keep themselves in the game. This allowed the game-tying goal by Jenna with only three minutes left to go. Jenna said she felt “shocked” yet “excited” when it went in. The team and crowd were fired up and the tension grew as both teams had about two minutes left to decide who went home with the win. During this high pressure moment, however, Litchfield seemed to break down completely on the defensive end. Jenna beat her defender in a foot race and sent a pass to Abi King, ‘21, which she then put past the goalie. The team still had two minutes to defend and it looked uncertain. 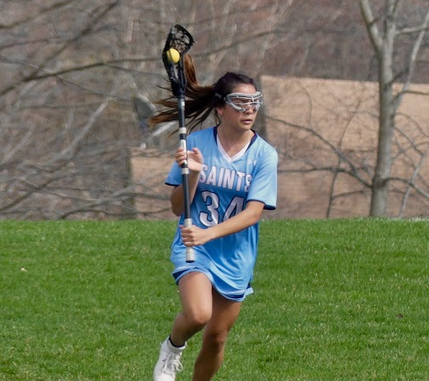 However, after a faceoff win by Samantha “Jade” Brinker, ‘21, possession belonged to the Saints to run time out. Litchfield, luckily, wasn’t able to get the ball back and the Girls JV Lacrosse team put a win on their record for the season. The team looks to stay strong when going to Ethel Walker on Wednesday, April 17.